All CGS members and members of other local societies are welcome to attend an open meeting of the California State Genealogical Alliance (CSGA) at the California Genealogical Society Library, 2201 Broadway, Suite LL2, Oakland, on Saturday, February 27, 2010. The gathering is an opportunity for Bay Area genealogists to meet CSGA President Susan M. Roe, attend an Alliance meeting, have a tour of the CGS Library and hear a presentation by CSGA Past-president Lisa B. Lee. *Participants are encouraged to bring a lunch or visit a nearby restaurant. Please RSVP by email to Events@CaliforniaAncestors.org or download and return the registration flier. Lisa Lee is a past president of CSGA, a past CGS board member, lecturer and hosts Got Genealogy? 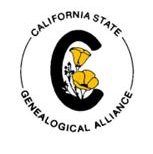 Founded in October 1982, the Alliance serves as a statewide association of independent genealogical societies, individuals and non-profit organizations which acts to further genealogical endeavors throughout the state of California. This alliance meeting is going to be a brilliant one with the presence of some eminent genealogists at one place. Hope to know and read more about this meetings.